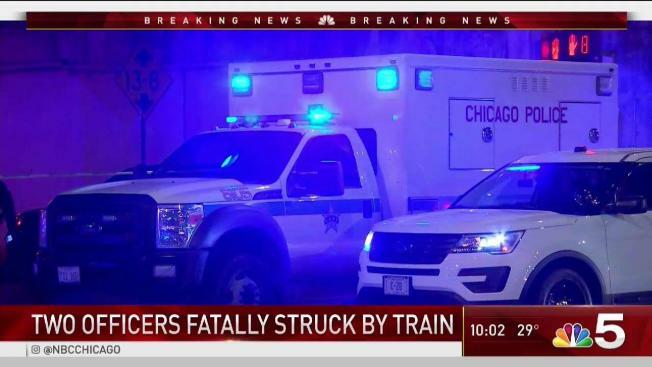 Two Chicago police officers were fatally struck by a train Monday evening on Chicago’s Far South Side, police said. The incident occurred near 103rd Street about 7 p.m. in the city’s Rosemoor neighborhood, Metra officials said. Police said the officers were responding to a "shots fired" call when they were struck by a passing train. They were on foot. The NICTD Indiana South Shore Train SS9119 was halted after the incident. The South Shore rail line uses Metra tracks. Metra shut down power in both directions. The officers were later identified as partners—both fathers—with a collective four years on the force, Chicago police Supt. Eddie Johnson said. “They have faced tragedy, after tragedy, this year,” Johnson said. Officer Eduardo Marmolejo was 36. Conrad Gary was 31. The superintendent referred to other deaths in the Fifth District over the past year—including two suicides and another on-duty death. A visibly weary Mayor Rahm Emanuel spoke of the difficulty to grasp more fallen Chicago police officers in a year where the department has had multiple tragedies befall it. “There are no words that can express the grief and sense of loss—this knocks you back on your heels,” he said. The Fraternal Order of Police tweeted "Prayers, please," shortly after the incident. Former Chicago police superintendent and Chicago mayoral candidate Garry McCarthy also tweeted after the officers were struck. Just now hearing @Chicago_Police lost 2 officers tonight. Pray for the brave men and women of CPD, they need our support. "Just now hearing @Chicago_Police lost 2 officers tonight," he said. "Pray for the brave men and women of CPD, they need our support."